I transferred schools at the end of last year, so for the first time in seven years, every one of my students I meet on the first day of school will be a stranger. This means that the first hour I have with each of the four classes is not only their introduction to the course, but also their introduction to me. It won’t take long for them to make an impression of me, of mathematics, of their classmates, and how I expect us all to co-exist for the next five months or so. I have written on first day tasks before, but not for several years. In that post I identify four “attributes” of an effective first-day task*. 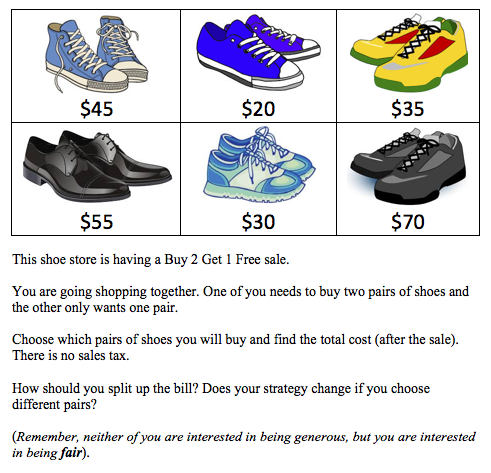 One of the tasks I settled on for this year was The Shoe Sale task from Peter Liljedahl. (Other bloggers have documented work with the problem as well: e.g. Fawn Nguyen and Chris Hunter). I want students to experience the continuum of “proof” as they develop a fair strategy for one combination of shoes and (eventually) generalize this to all possibilities. (This may or may not result in a brute force strategy of listing and calculating every possibility). I wonder if students will think that fairness changes from scenario to scenario. Providing multiple scenarios allows for this to (possibly) become relevant to their solution. I wonder if students will argue that it is impossible to be fair in specific scenarios? I want students to apply their strategies with multiple combinations of shoes. If multiple strategies emerge, I want to be able to choose a new scenario and have the class apply each one. In this way, it provides me more information on their competency with basic skills. I want to tease out the intricacies that choice provides. What if the partner who only buys one pair gets the most expensive pair? What if they get the cheapest pair? Does that matter? Are these different scenarios, or the same? I (tangentially) want students to ask how many possible choices can be made. What if both customers want the same pair of shoes? Is this possible? How does that change how many possibilities exist? It could be that you feel the provision of choice will not change the fact that there must be a fair way to divide up the bill based on ratios, percentages, yada yada, etc. That’s great; actually, that’s really great! Maybe your gut instinct that the remake doesn’t change the problem’s dynamic is correct. Maybe this re-visioning has not shifted which content will become relevant in its solution. My point is: Through widening the sphere of possibility by including more choice, the remake shifts the burden of proof to the solver. That is, even if students (stubbornly) insist that the many scenarios make no difference, it this their job to convince me. In that sense, the remake has worked perfectly. *Looking back, I cringe at the thinking of my former self. First with the idea that attributes exist in tasks somehow outside of human beings, and second with the notion of “real” mathematics (see revised position here). I imagine I meant “curricular” content so the task could kill two birds: Ecology building and pre-assessment of certain skills. These self-rebuttals are an interesting part of longitudinal blogging. It is an interesting (yet, embarrassing) trace of professional development.